[E. V. Lucas, author, editor and poet.] Holograph (signed 'E. V. L.') of apparently-unpublished poem titled 'Herefordshire'. 1p., 8vo. Signed at bottom right: 'E. V. L.' Sixteen lines of verse, divided into two eight-line stanzas, beginning: 'As I went down to Hertfordshire | To visit Hatfield Oak, | I met the prettiest girl, to whom | Courageously I spoke.' The conceit of the poem is that the girl is the 'Queen of Hearts', and the author is trumped in his suit of her by the king, the last two lines reading: 'The King strode in, the Queen to win, | And I – I lacked the Ace.' Charles Lamb, whom Lucas greatly admired and whose works he edited, had particular links with the county of Hertfordshire. [Jeanne de Casalis, film and stage actress, writes to 'Mr. Knot' (E. V. Knox) of 'Punch'.] Autograph Card in the third person, informing him when she will be doing a BBC radio broadcast of his 'Reparation'. On her letterhead, Hunger Hatch, Little Chart, Kent. Postmarked 28 June 1941. [ Sir George Clausen, RA, to E. V. Lucas. ] Autograph Letter Signed ('George Clausen') from Clausen to Lucas, a letter of introduction for the artist Curmow Vosper. On letterhead of 61 Carlton Hill, NW8. 14 February 1932. 2pp., 8vo. In good condition. 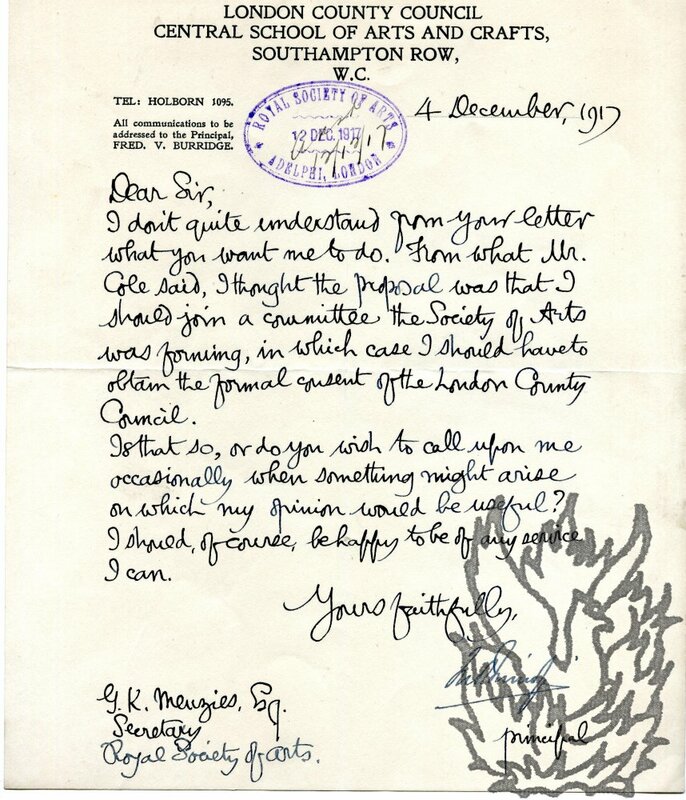 Clausen is writing to Lucas in the latter's capacity as chairman of the London publishers Methuen & Co., and the letter is a 'note of introduction' for Clausen's 'friend Mr Curnow Vosper, who has written and illustrated a children's book, which he wishes to submit to you. | Mr. Vosper is a painter, a member of the old Water-colour Society, and I have no doubt his work is known to you. I hope that you may find this his latest work, of interest.' Vosper does not appear to have published any book during this period, either with Methuen or anybody else. On letterhead of 34 Pembroke Square, W.8. [ London ] 24 April . Anthony Powell describes Audrey Lucas in his journals as 'Evelyn Waugh's on and off mistress for some years'. 2pp., 12mo. In fair condition, aged and lightly creased, with pinholes to one corner. One catches a hint of the clipped and brittle tones of the age: 'I have been away in the country and ignoring newspapers as a rest. It was only today that I heard of Herman's death. So, will you forgive me for not having written before to say how very much I grieve for you. I am so terribly sorry. [ Arthur Davenport, librettist. ] Typed Letter Signed to composer Herman Finck regarding his appeal to the Musicias' Benevolent Fund, his career, and two books sent to E. V. Lucas of Methuen & Co.
11 Primrose Hill Road, N.W.3. [ London ] 9 April 1931. 1p., 4to. On aged and worn paper. Thirty-eight lines of text. Written with the forced Wodehousian bonhommie of a desperate man. He has had an operation at a nursing home, so the beginning of the letter needs to be taken metaphorically: 'My dear Finck, | This is a nice kettle of Fish and no mistake! | Came out of jail day before yesterday, but only on ticket-of-leave. Strict police supervision for two years - finger-prints - strawberry-marks - nothing kept secret! | However, they say they can make a job of it and my tail, such as it is, remains vertical. [E. V. Lucas.] Copy of his book 'Charles Lamb and the Lloyds', marked up 'With corrections for Second Edition' in his autograph, with new preface and other additions loosely inserted. London: Smith, Elder, & Co., 15 Waterloo Place. 1898.
xiii + 297pp., with frontispiece and four plates, and six-page publishers' catalogue at end. Blocks of text have been cut out by Lucas, between pp.205 and 232, and the three leaves carrying pp.199-204 have been removed. Otherwise in good condition, in worn burgundy cloth binding, gilt. Lucas has written 'With corrections for Second Edition' at the head of the title page. (There was no second edition.) Emendations throughout in pencil and pen. [ Joint V. A. D. Committee (British Red Cross and Order of St. John of Jerusalem), ] Printed 'Certificate of Enrolment in a Voluntary Aid Detachment and Permit to wear the Uniform', signed by two officers (Henry Gandy and John Mason MD). Headed: 'J. V. A. D. 24. | Joint V.A.D. Committee. | The Territorial Force Association. | The British Red Cross Society. | The Order of St. John of Jerusalem.' [ 83 Pall Mall, London. ] 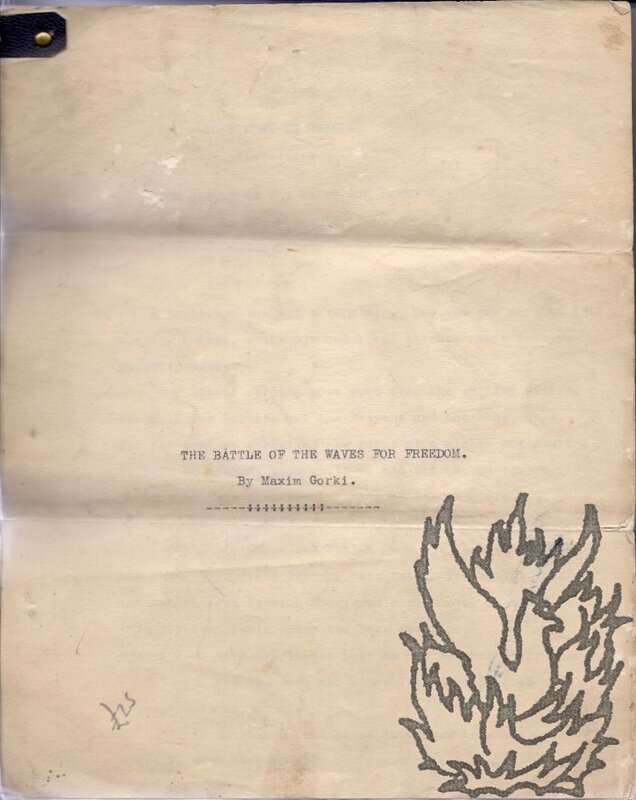 Dated 1 November 1916. 4pp., 16mo. Bifolium. A scarce piece of First World War ephemera, on creased and aged paper. The certificate has been made out in order to enroll 'Dorothy Marion Cameron Bower' into 'Detachment  in the County of [Westmorland]', but has not been signed by her. The first page carries the conditions of use, the second a declaration by the signatory, and the third the permit itself, with facsimile signatures of Arthur Stanley, Chairman, and Louis Pearson, Hon. Secretary, and the actual signatures of Henry Gandy, County Director, and John Mason M.D, Commandant. Lucas's letter is 1p., 4to. In fair condition, lightly spotted. He informs Wilber that when he arrives at the office the following morning, he will find that 'the two portrait tablets of the late Sir Algernon Methuen, the founder of our firm, have been unveiled'. He explains that the tablets are 'a gift to the firm from Lady Methuen, whose wish is that each member of the staff should possess a copy of the accompanying Memoir'. The booklet is 13pp., 4to. With three plates including collotype frontispiece portrait of tablet of author. [ Percy V. Bradshaw, Director, Press Art School. ] Seven Typed Letters Signed to Sgt R. Charles, giving detailed instruction and advice, together with twelve printed pamphlets of lessons of 'Art Training by Nature's Methods'. The seven letters on letterheads of the Press Art School, Tudor Hall, Forest Hill, London. Between 17 June 1946 and 16 April 1947. The 19 items in fair condition, slightly dogeared and lightly aged and worn, with the last couple of leaves of the last lesson (see below) torn and worn. 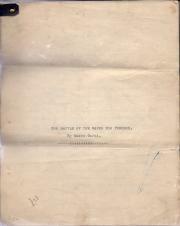 The seven letters (all signed 'Percy V Bradshaw') total 30pp., 8vo. [ Andrew Varick Stout Anthony, American wood engraver. ] Autograph Note Signed ('A. V. S. Anthony') to W. E. Ambler. On letterhead of the St Botolph Club, 2 Newbury Street, Boston. 8 January 1889. 1p., 12mo. In good condition, on lightly-aged paper. Reads: 'Dear Sir: | I have nothing at present except some note book sketches, otherwise I should be pleased to acceed to your request. | Yours truly | A. V. S. Anthony'. [ Printed First World War pamphlet. ] An Infantryman on Strikes. 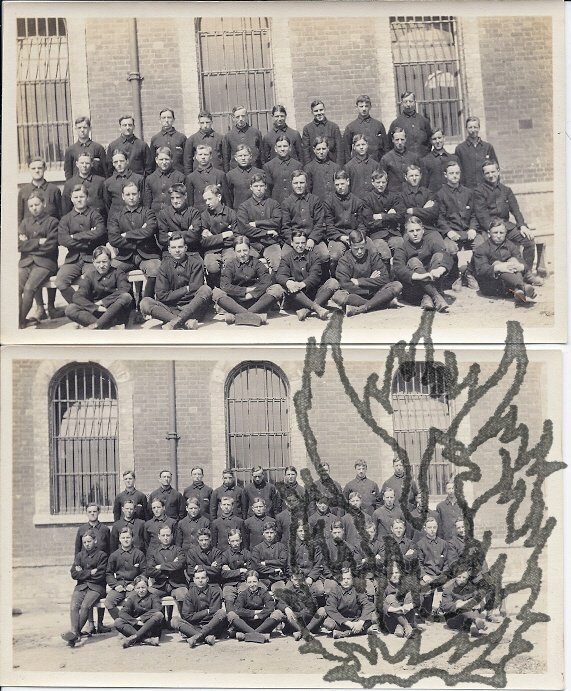 An Appeal to the Workers of Great Britain | By H. V. Holmes | Sergeant, London Scottish. 20pp. on shiny art paper. Dimensions of pamphlet 11 x 12 cm. Stapled into grey printed wraps. Holmes is named as the author in the title on the front cover, while the text ends on p.20 with the attribution to '"INFANTRYMAN."' In good condition, with light signs of age and wear. The author's case is summed up towards the conclusion: 'Can you see him, Striker, striving, fighting, dying, at a shilling a day, that you may live in comfort at home? Can you see his parents, his wife, his children, his sweetheart, praying daily for his safety, hoping blindly for his return? [ Mary Knox, illustrator. ] Printed illustrated Christmas card 'from E. V. & Mary Knox.' With manuscript address and telephone number at foot. Printed in black on one side of a 12.5 x 16.5 cm piece of card. A charming image, framed within the drawn curtains of a theatre stage, showing four snowmen, dressed as toff in top hat, flat-capped figure with spade, lady with shawl and umbrella, and bowler-hatted figure with muffler and broom. At head of image 'A Merry Christmas', and at foot, 'from E. V. & Mary Knox'. In blue ink in border at foot of page: '110 Frognal. N.W.3.' and 'Hampstead 7330.' Mary Knox's father E. H. Shepard was the illustrator of the Winnie the Pooh books. [E. V. Knox, editor of Punch.] Two Autograph Letters Signed (both 'E. V. Knox') to Anglo-Irish poet Sylvia Lynd, the first concerning an 'American publisher', and the second a letter of condolence on the death of her husband Robert Lynd. 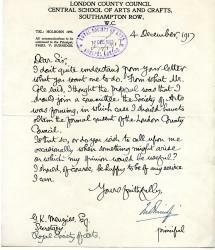 ONE: On letterhead of 34 Well Walk, Hampstead; 1 Nov. 1926. 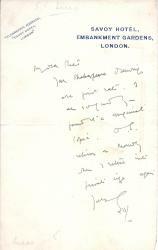 TWO: On letterhead of 110 Frognal; 7 Oct. 1949. Both items are 2pp. 12mo, on bifoliums. Both in good condition, on lightly-aged paper. ONE: 'I was so sorry I couldn't come this afternoon - especially if he was a simple kind of American publisher. Owing to a rash fit of indulgence in Church going I had to have tea elsewhere'. TWO: Letter of condolence on the death of Robert Lynd. [Percy Venner Bradshaw, Director, The Press Art School, Forest Hill, London.] 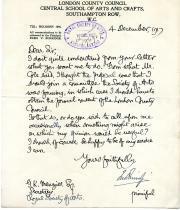 Typewritten circular, signed ('Percy V. Bradshaw') and addressed to G. Filby. On letterhead of The Press Art School, 37 Dacres Road, Forest Hill, London, S.E. 5 November 1931. 1p., 8vo. In good condition, on lightly-aged paper. Letterhead illustrated in old-fashioned style, with a bare-chested woman clutching a pen, floating at the head of a twirl of loose papers and fabrics. The circular, which encloses a prospectus, draws the recipient's notice to the nature of the two courses offered within it. [Printed item.] First Regiment, L. L. V. | The Memorial of the Seventh Company to the Committee of the Bread-Street Ward Armed Association, agreed on at a Meeting of the said Company, [...]. '[...] held at the White-Horse Tavern, Friday-Street, on Monday, November 12, 1804. Mr. Josiah Lowe, in the Chair.' Sorrell, Printer, Bartholomew-Close, Smithfield. 2pp., 8vo. On the first leaf of a bifolium of laid paper with watermark 'WILLIAMS | 1803'. On aged and worn paper, with closed tears and chipping to extremities. Typed Testimonial Signed ('Fred Burridge') from F. V. Burridge [Frederick Vango Burridge], Principal, London County Council Central School of Arts and Crafts, for the artist and educator H. Clarence Whaite. On letterhead of the London County Council Central School of Arts and Crafts, Southampton Row, WC1. 28 June 1926. Whaite was first cousin twice removed of his more famous namesake. He was himself an excellent artist and teacher, and there is a large collection of his work at the Whitworth Gallery in Manchester. 1p., 4to. In fair condition, on aged and dusty paper. 'Mr. H. C. Whaite, after attending at the Slade School, joined this School as an evening student in September 1925, since which time he has studied Pottery, Design and Decoration. [Printed Second World War pamphlet.] Homeward Bound. Issued by the Quartermaster General's Branch (Movements Directorate) G.H.Q. (India). Cover and sketches by Capt. A. S. Morris, R.E. 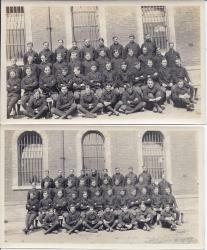 'GIPD - M 2079 Army - 12-12-44 - 5,000.' 12 December 1944. + 28pp., 12mo. In coloured illustrative wraps. Morris's illustrations are light and fresh, the first being a caricature of 'the enemy': a sour-looking bespectacled Japanese army officer. The first section, which it illustrates, is on 'Security' and concludes: 'Remember that in disposing of household effects, releasing servants from employment, etc., you may easily give away too much information. 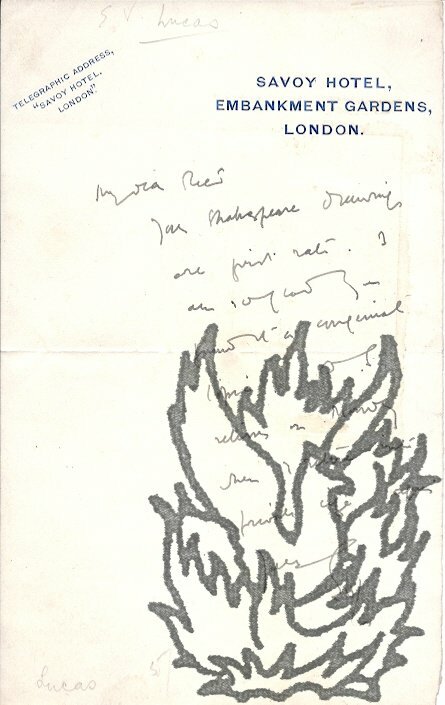 Autograph Letter Signed ('EVL') from E. V. Lucas to 'My dear <Reed?>', concerning his 'Shakespeare drawings'. E. V. Lucas [Edward Verrall Lucas] (1868-1938), author, authority on Charles Lamb, and chairman of the publishers Methuen & Co.
Undated. On letterhead of the Savoy Hotel, London. 12mo, 1 p. Text clear and complete. Fair, on lightly-aged paper. Lucas's handwriting is not straightforward, and the recipient's name is unclear. His 'Shakespeare drawings' are 'first rate'. Lucas retires 'into private life again' on the Monday, when 'O. S.' returns. Women's Corona Society in association with the Ministry of Overseas Development. Report of Conference on "Women's Education: A Challenge". Held at Marlborough House. [Privately printed, London.] 18th to 20th May, 1965. 4to, [viii] + 26 pp. In blue printed wraps. Good, on lightly-aged paper, in slightly dogeared wraps. Introduction by Gwilliam; opening address by Ennals; summaries of speeches and notes on speakers. Two copies on COPAC (not major libraries).